Are you having a difficult time building muscle? If so, the legendary bodybuilding workout routine taught in the New BRAWN Series Book 1 is tailor-made for you. If you’re new to Stuart’s guides, this is the perfect one to start with. From just this one easy-to-read but thorough guide you’ll get everything you need to know in order to make brilliant bodybuilding progress. Why listen to Stuart McRobert? Over the last 30 years he has specialized in teaching bodybuilders how to build muscle, especially hardgainers. If you’ve already read one or more of Stuart’s other works, this new one will remind you of the most essential background information, pump you up to implement the legendary workout routine properly, and reinvigorate your bodybuilding progress. His new series complements his best-selling guides BRAWN and BEYOND BRAWN. Building on the methods promoted in those two classic works, the new series presents premier bodybuilding workout routines that are immaculately detailed, rich in new material, thoroughly up-to-date, and proven to be super-effective. 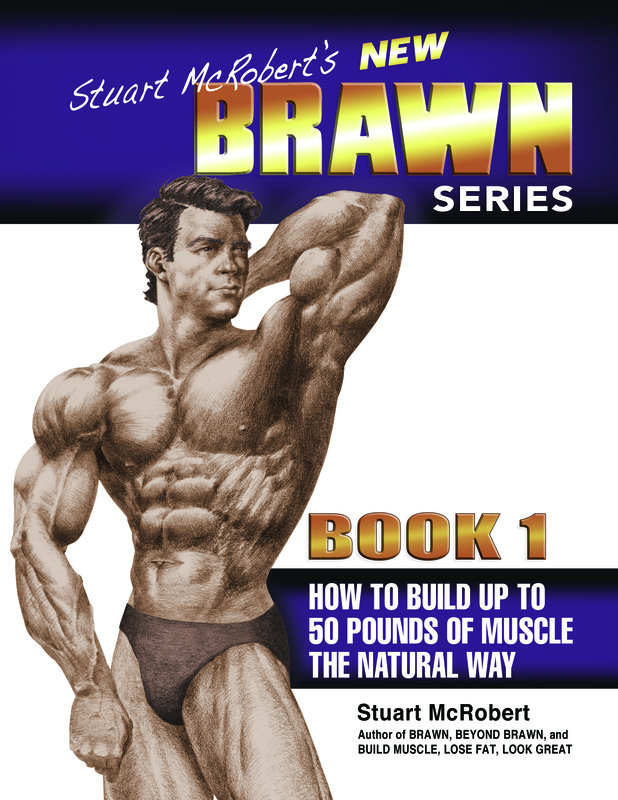 The guidance in the New BRAWN Series Book 1 teaches what Stuart calls “Course #1.” Before anabolic steroids started to infest the bodybuilding world, variations of Course #1 were famous, popular, and responsible for building tons of muscle. But in the 1960s, when the use of steroids became popular among competitive bodybuilders, the popularity of Course #1 began to wane. Since then, the training routines most commonly promoted in the bodybuilding world have been those used by physique stars who were genetically gifted for bodybuilding and on steroids. But those training routines don’t work well, if at all, for most other bodybuilders. It’s very effective. Its track record for producing lots of muscle growth is illustrious (even for hard gainers). It’s personalized. You’ll be taught how to modify the routine so that it suits you perfectly. When applied properly, this may be the #1 muscle-building routine for drug-free, genetically typical bodybuilders. This book provides the most complete, up-to-date and useful guidance ever published on this fabulous bodybuilding routine. It includes the routine’s history, the modernization of it, the essential foundation phase, the special training schedules, how to train (including exercise technique in great detail), the components of recuperation (including nutrition), and two inspiring illustrations of how to put Course #1 into practice. If other instruction hasn’t produced the muscle mass you want, why stick with it? Instead, apply the routine that’s explained in this book — it’s proven to build lots of muscle mass fast.